IN GHANA, RELIGIOUS CONCENTRATIONS HAVE A POWERFUL STRONGHOLD. ‘Empowerment’, as the phenomenon is called, is full of clergymen whose faces are shown on many street walls announcing the next encounter and encouraging people to join the movement, to adhere to the cause. Near Independence Square some children play football on a scrap of wasteland where barely any weeds flourish. Along the wing a boy runs as if he were filming a tracking shot. I later discover that he is the coach of one of the teams. The kid is passionate and never stops shouting, ranting, gesticulating. He is going to end up hoarse. After a short while everybody joins in and begins to scream and the entire crowd launches itself to hold onto a grille that protects a window from which a glimpse of a tiny television housed at the end of a darkened room can be caught. Some Ghanaian team has scored, and everybody is celebrating. I also approach to see what all the fuss is about, and, suddenly, all the kids ask me to take their photos. When I show them to them, they huddle around me and tug on my camera, as if they wanted to pull my arm off. I keep on walking and find myself in the archway that enthrones Independence Square. A square of notable size which is also flanked by another enormous double arched sculpture, more like a double semicircle, forming what looks like a giant M. Bearing witness to this marvel is the Statue of the Unknown Soldier. Yet despite its grandiosity, the Independence Square appears to be deserted, with no men or women at work – bored – and all I can see are several Ghanaians scattered amongst their seats. The midday nap is calling. There is indeed a moment during the day in which Ghanaians, Africans, close their eyes, curl up, shelter their head between their arms, stretch their legs and sleep, sleep, sleep, they switch off and disappear from the face of the Earth. It is of little matter to them where and who they have before them. It happens everywhere: inside a taxi, in an ice-cream parlour, in a Ministry… It happens to them all: men, women, children… They all fall under the hypnotic spell of that encounter with oneself, with rest. The sun. Yet the peacefulness of the scene lasted only until the next morning, when a fierce-looking woman called Clara approached the hotel and hugged me instead of shaking the hand that I offered her. We sat down in the small auditorium in the reception and Clara informed me about the different excursions organised by her company. The decision was easy: I am off to Cape Coast and Elmina. Slavery and fishermen. Outside a gold-coloured Toyota Land Cruiser awaits me, with Francis, the driver, at the helm. After the greetings, I recline the seat back and we hurtle towards a chaotic Accra teeming with cars, traffic and upheaval. Whenever we stop, men, women and children appear from nowhere with a never-ending array of products on their heads to sell. We manage to exit Accra with great effort and head westwards, to the symbols of slavery, in Cape Coast. Along the route we are treated to a landscape full of banana and plantain trees, mixed with plantations of yams, mangos, more palm trees… The villages are all supplied with electricity, the motorways are in good condition and the “shanty towns” are also more solid and larger than the ones that I have seen before in Liberia. So much greenery. As we push onwards, we leave behind towns like Kokrobite, Winneba, Apam, Saltpond, Anomabu and finally reach our destination – Cape Coast. I get out of the car and before me I encounter an imposing castle. Taking advantage of an oversight on the part of the staff, who were not even bothering to check whether the tourists were entering at that time, I sneak inside this fort with thick white walls. A few seconds later, I find myself with the entire Atlantic Ocean before me, and a resplendent line of cannons and ammunition forming dozens of balls. I move up to some kind of first floor of the fort, and from there I can see what was one of the main bastions of slavery. Indeed, Cape Coast, like other forts on the Ghanaian coastline, was built in the Sixteenth Century by several European powers, such as the British, Danes, Dutch (some people also mention a French presence, though the guide insists that the French did not have anything around here…) Germans, Portuguese and Swedes. I was genuinely surprised to see Danes and Swedes on the blacklist. It turns out the Scandinavians were in on it too. Aha. 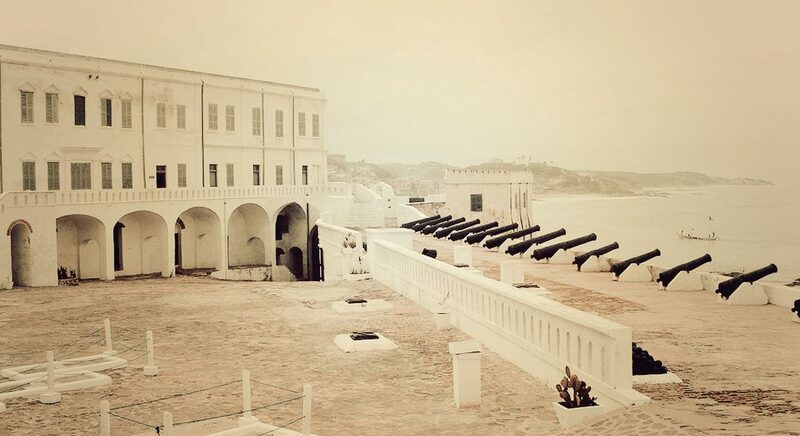 Yet it was the English who had the starring role in the construction of the fort at Cape Coast, which they used to defend themselves from their European rivals and as a solid infrastructure that allowed them to trade in slaves. The main aim was to dominate the Gold Coast and the Gulf of Guinea. At the beginning, the forts (by the 18th century there were thirty-seven along the coast) were built as warehouses for diamonds and gold. Later on, the slave trade was soon identified as a much greater source of income, and the forts or castles were used mainly as prisons to house slaves before being shipped off to, largely, America. The guide, who adopts a dramatic tone of voice when recounting the brutality of the era, shows us with a pained look the different cells or pits where the black prisoners were locked up. A few metres further on, we find the Door of No Return, the place where the black slaves were huddled like sardines in a tin across to the other side of the Atlantic. Strangely enough, I open the Door of No Return and discover a colourful spectacle featuring a series of boats and flags that provide the scene with an almost carnival touch. A few centuries ago, the atmosphere was very different. Nice piece of writing, like I wrote earlier. Congratulations.